Israel has not revealed any response measures to the rocket fired from Syria. 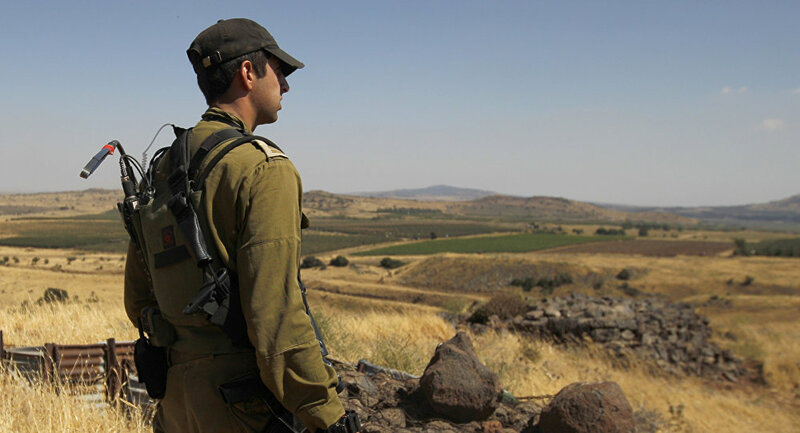 A projectile launched from Syria fell on the Israeli-controlled part of the Golan Heights without causing any damage, the Israeli army's press service has reported. However, the military thinks that the rocket launch was not deliberate and was allegedly "stray fire from the internal fighting" in Syria between the government and opposition forces. No plans on response measures have yet been reported. — IDF (@IDFSpokesperson) 3 декабря 2017 г. The accident took place a day after several Israeli ground-to-surface missiles were intercepted by Syrian forces in an area south of Damascus, while a few others reportedly hit an ammunition depot of the Syrian Army, causing explosions in an area between the towns of Kiswah (Kesweh) and Sahnaya. The missile attack, however, was not confirmed by the Israel Defense Forces when contacted by Sputnik. In a recent video posted by Israeli Prime Minister Benjamin Netanyahu on his Facebook page, he explains the country's policy on the Syrian conflict, claiming that Iran was planning to extend its military presence in Syria and thus provoking Tel-Aviv to respond. Tehran has repeatedly denied reports of having a base in Syria as well as conducting military operations there, however, stressed its cooperation with the country's leadership in the fight against various terrorist groups, including Daesh, and acts as one of the guarantors of the ceasefire in the Arab Republic jointly with Russia and Turkey. The Israeli annexation of the disputed territory of the Golan Heights, a part of which had been first seized during the Six-Day War in 1967, has been repeatedly condemned by the international community. According to a UN resolution adopted in 1981, the Golan Heights were declared as illegally occupied by Israel. In 2008, the United Nations reiterated its calls for Tel Aviv to return the "annexed territory" — something that, according to the incumbent PM Benjamin Netanyahu, "Israel will never do." Israel and Syria in 1974 had signed the Agreement on Disengagement, which officially ended the Yom Kippur War, a period when Israel had control over the entire territory of the Golan Heights, including the area now belonging to Syria. The two countries have not signed a peace treaty yet.